Unique One-Of-A-Kind Sign For Your Layout! Even out-of-the-box buildings become unique to your layout with this one-of-kind custom laser-cut sign. 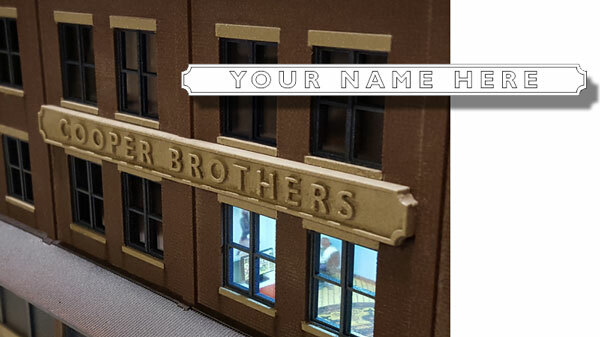 Be it the name of an industry, a retail store, or the name of your railroad or train station, now any building can have a feel that is all yours. Just use the Add to Cart button to add the sign to the cart and checkout as you would with any other products. Once we have received your order, we’ll contact you via email to find out how you would like your sign to read (limit 3-15 characters). Once you have replied, your sign will then be produced and shipped in just a few days. Order more than one identical (same lettering) sign and you’ll save 10% off the price of each sign. You don’t have to do anything extra; the discount will appear automatically in the Discounts section of the Shopping Cart. Copy this Custom Laser-Cut Sign - Industry + Commercial to your MY ACCESSORIES roster.